All students enrolled in internships and study exchanges in the seed production program are required to prepare written reports and present seminars to the department based on their work or research experiences. One undergraduate student completed an 8-month internship with a farm in New Zealand during this period and will present a seminar to the department during fall term. Five other students completed internships with seed companies or agricultural service companies in the Pacific Northwest. Two of these students have now graduated and have been employed by agricultural service companies. No students participated in study abroad programs during this past academic year. Three undergraduate students completed internships this past year – two graduated and returned to farms while the third is still in school. Five undergraduate internships are in progress at this time and will be completed at the end of the summer. Three of the students have internships with seed companies while the other two are interning with agricultural services companies. One additional student will be leaving this fall for an internship in New Zealand. The undergraduate student in a long-term study exchange in Nicaragua completed his senior thesis and has now graduated from OSU with degrees in Crop Science and International Studies. This student will be entering graduate school later in the year. One of the program’s students completed an internship with a vegetable seed company in California while another began an internship with a seed company in Oregon. One of the students mentored in the program completed an internship with the USDA-NRCS and will be employed there after graduation. One student worked on the Hyslop Professorship research plots, and will now enter the graduate program in seed production here at OSU. One student continued his long-term study exchange in eastern coastal Nicaragua. The purpose of the study exchange in Nicaragua is to conduct research on the agricultural practices of the indigenous Miskito people. This work is being conducted as part of the student’s undergraduate thesis project for an International degree. One student participated in a study exchange in Nicaragua. The student was on the exchange from September until December 2010 studying crop production systems in that nation and the potential for improvement among the indigenous people of eastern coastal Nicaragua. One student worked on the Hyslop Professorship research plots for their internship. Another student will be placed with a seed company for an internship in summer 2011. Three students participated in domestic internships in the Willamette Valley in the 2009-10 academic year. Two students worked for companies that provide services and materials to local seed growers and the third worked on the Hyslop Professorship research plots for her internship. Two of these students will be continuing next year to complete their degrees while the 3rd has graduated and has returned to his family farm. One student travelled to New Zealand this past year to work in an international internship. The student worked for a grass and vegetable seed production farm in the Canterbury Plains region of New Zealand. This student will begin law school after graduation where he expects to focus on agricultural law. Three students travelled to New Zealand for international internships. These students worked for seed production farms and seed companies over their 3-month experiential training. Two of the students have now graduated – one returning to her family’s grass seed production farm and the other is now employed with a agricultural service company in support of Willamette Valley seed growers. Four students participated in domestic internships in the Willamette Valley during the same period. These students worked for companies that provide services and materials for Willamette Valley seed growers. Three of the students have now graduated – one returning to his family’s farm in eastern Oregon, and the other two now employed by agricultural service companies in the Willamette Valley. 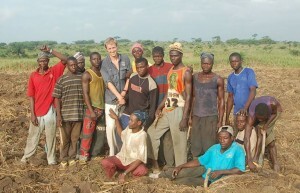 One student participated in a study abroad program in Ghana. Outside the formal classroom studies, the student was placed with a local seed supplier in Ghana and worked with local farmers.